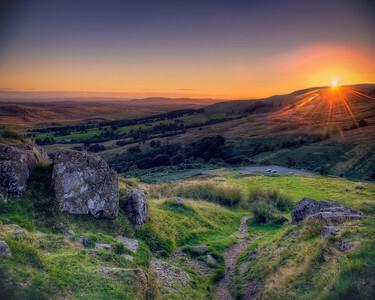 A sunset view of the Scottish lowlands, looking east from the Campsie Hills. If i was younger and / or fitter, I might have climbed up a little further, but this little rocky pass offered a handy foreground for this image. 2013. 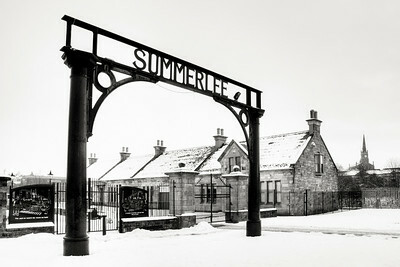 The gates to the Summerlee Heritage Park in Coatbridge, Scotland. This shot was taken in 2009, during the heavy snow event dubbed "the big Freeze", which was to be surpassed the following year! 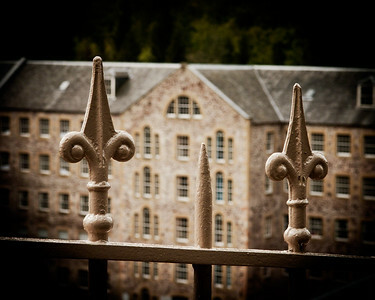 The Summerlee Heritage Park is a gem in the heart of Scotland. A large tribute to the industrial era of Scotland from more than a century ago. The gates here were seen under a reasonably substantial blanket of snow in Coatbridge, 2009. 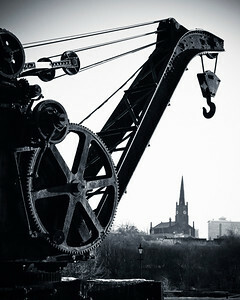 This view of the museum piece crane in the Summerlee Heritage Park acts as a handy frame for a view of St. Andrew's Church at the top of Baird Street in Coatbridge. 2009. 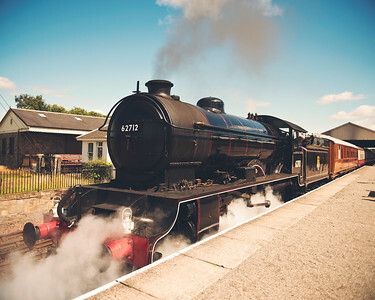 This is the steam locomotive #62712 'Morayshire', waiting to depart on the Bo'ness & Kinneil Railway, Scotland, 2014. 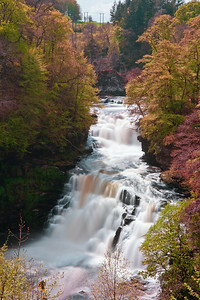 These are the Falls of Clyde,aA raging torrent on the River Clyde near New Lanark, Scotland. The water is generally only a trickle, but on one or two days of the year, upstream water extraction (for hydro) ceases and it is returned to its natural state. 2012. 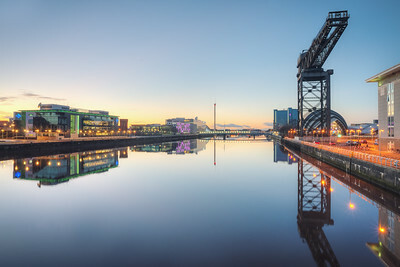 Anderston Quay on the River Clyde, Glasgow, 2015. I wish the wind had been a little calmer that night, to better capture the reflections from this vibrant waterfront. 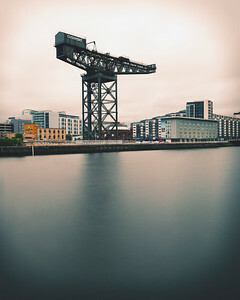 The Clydeport Crane, standing proudly in Anderston Quay on the River Clyde, Glasgow, 2015. 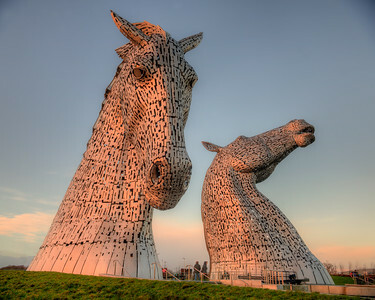 This is an important landmark in Scotland, and it fits in well with the more modern development growing up around it. 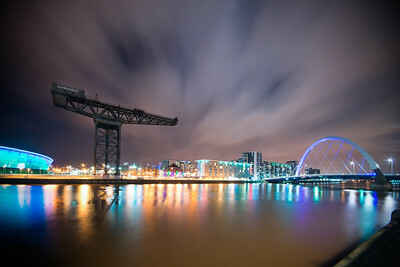 The wind was enough to produce this nice long exposure effect in the sky over Anderston Quay on the River Clyde, Glasgow, but it was a little too much to see some nice reflections in the water. 2015. 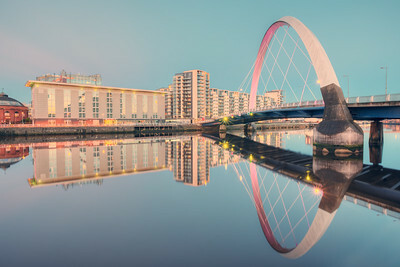 This is, what is locally known as, the Squinty Bridge on Anderston Quay on the River Clyde, Glasgow, 2015. It's generally lit up quite nicely, right along the arch, creating this subtle effect. 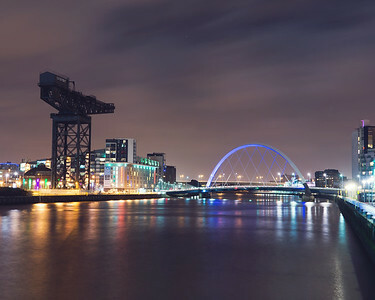 The Armadillo, the Hydro, and Clydeport are an inescapable trio, lit up on Anderston Quay on the River Clyde, Glasgow, 2015. 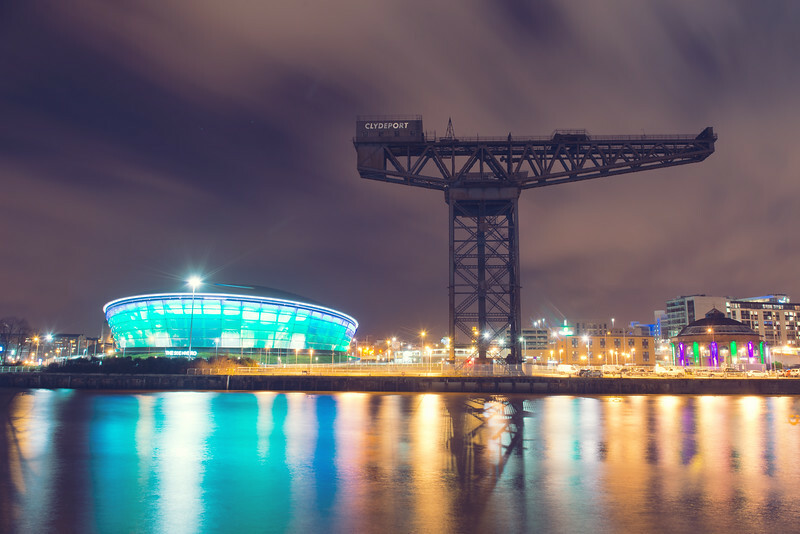 I love that Glasgow has decided to light up these structures like this - a magnificent sight in the Second City of the Empire. 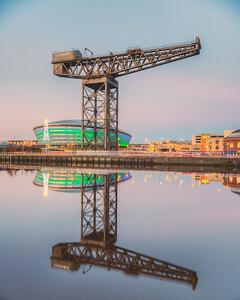 This is the Hydro (the newer of the auditoriums) and Clydeport, standing proudly on Anderston Quay on the River Clyde, Glasgow, 2015. 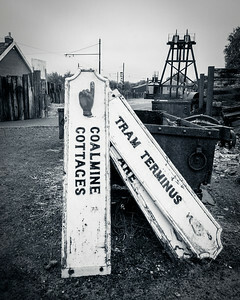 A collection of old signs in the grounds of the Summerlee Heritage Museum, Coatbridge, 2009. On reelection, though, I'm not sure just quite how old these are - were they created for the museum itself? This is Tram No. 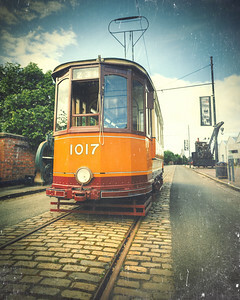 1017, a vintage vehicle which runs of a short route in the Summerlee Heritage Park in Coatbridge, 2016. 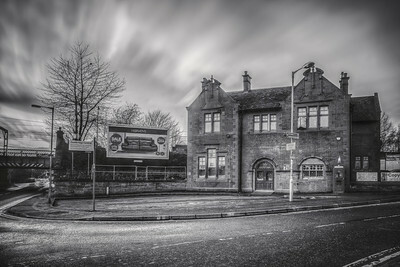 The old station building at Coatbridge Central station is a fixture in the town, even if it has been a generation since it served that purpose. Lying unused these days, it still brings back memories of the dark and dingy tunnels which accessed the platforms all of those years ago. 2017. 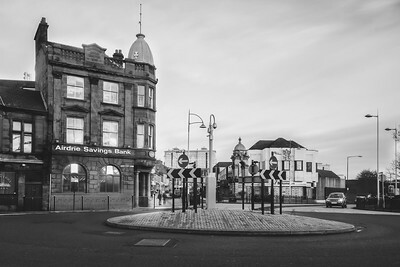 Another well known sight in Coatbridge: the town centre roundabout. The Airdrie Savings Bank is now closed and the fountain has been repositioned. Very much changed from just a couple of generations back. Scotland, 2016. 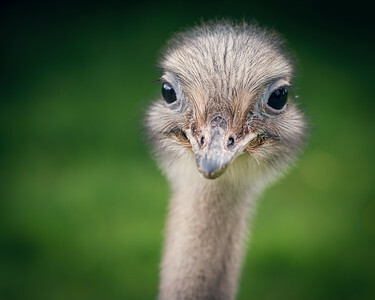 Taken at the Blair Drummond Safari Park, near Stirling in Scotland. 2017. What Summerlee does, it does well. 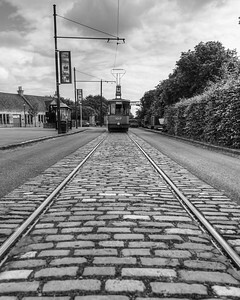 That includes this vintage cobbled and electrified tram route, which takes visitors down to the mock coal mines at the bottom end of the site. Coatbridge, 2017. 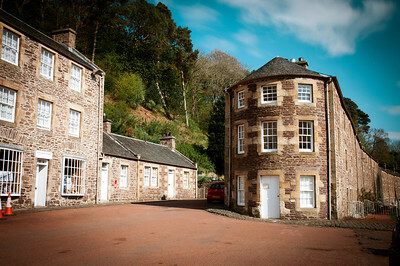 This is Cameron House, on the banks of Loch Lomond in central Scotland. Only six months after taking this shot, the hotel would suffer a devastating fire. Hope they can find a way to rehabilitate it. This image was taken from an excursion ferry on the water. 2016. 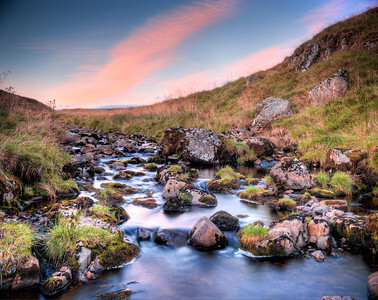 The Campsie Hills, a well known landscape that looks out over central Scotland, serving as a gateway to the Scottish Highlands. This image was taken during the snowfall of Christmas 2017, just as the sun was setting, creating the warm glow. This a shot of the canals at the back end of the Summerlee Heritage Park. 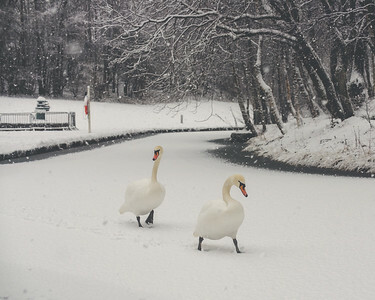 The December 2017 ice and snowfall had created less than ideal conditions for these swans, seen here searching for some open water. Scotland 2017. 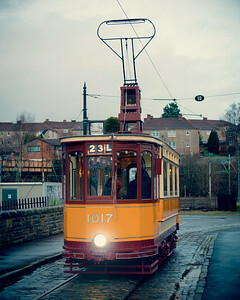 The Summerlee Heritage Park is home to some very picturesque sights, set right in the middle of suburban Coatbridge. 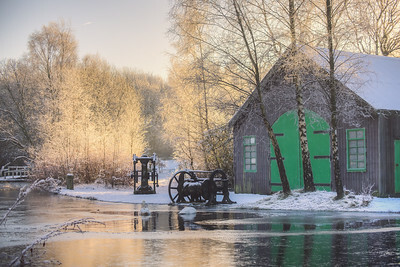 The wintry scene clearly helped to set this scene, shot in December 2017. 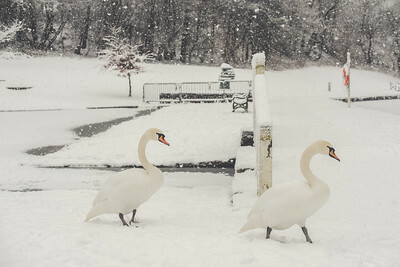 This was as close as I dared to get to these swans as they searched out open water amongst the ice and the snow in Coatbridge, 2017. 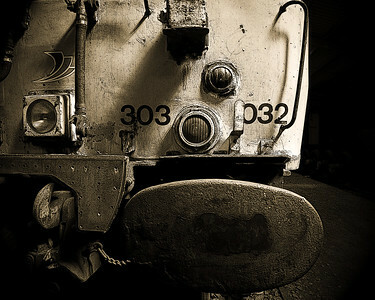 Taken in the Summerlee Heritage Park. Love the way the image captures the falling snow in this one. 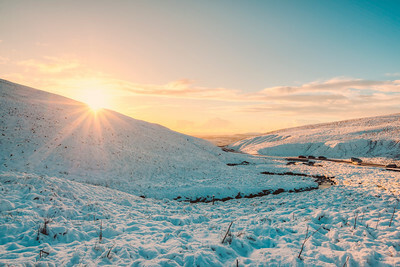 This is a panoramic composite - of five different images - taken during the winter snow in Coatbridge, at the Summerlee Heritage Park in Scotland. Note the two swans heading straight for the open water in the canal. 2017. 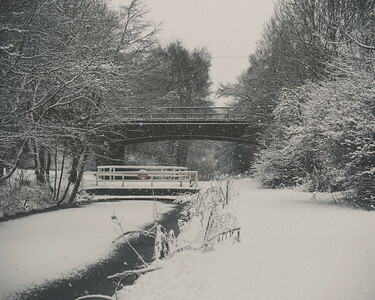 A snow bound canal at the back end of the Summerlee Heritage Park in Coatbridge Scotland. Love the way the safety ring is the only splash of colour in this scene, dominated by the falling snow. Scotland. 2017. 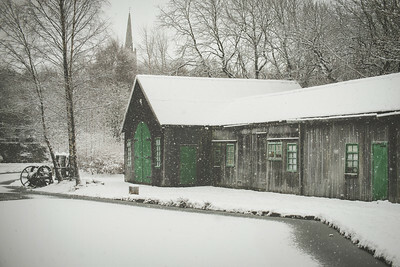 Not sure what the use this little out-house for in the Summerlee Heritage Park - but the splash of green colour sure did make for an interesting subject during the snowfall of December 2017 in Coatbridge, Scotland. 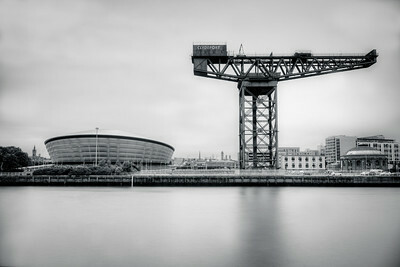 This is a 20 second exposure (f/8) and using a 10 stop filter of the Clydeport Crane on the banks of the River Clyde in Glasgow, Scotland. I loved the way the light of the setting sun fell on this old structure. 2017. 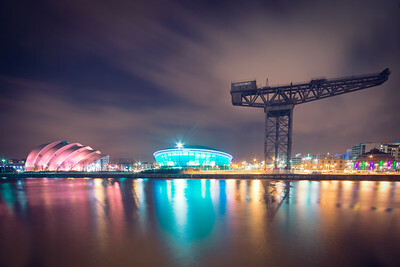 I just love the way they light up the Hydro on the River Clyde in Glasgow. It makes for such an interesting background, set against the sunset and the Clydeport Crane. Just glad the wind was so calm, creating these nice reflections. Glasgow, 2017. 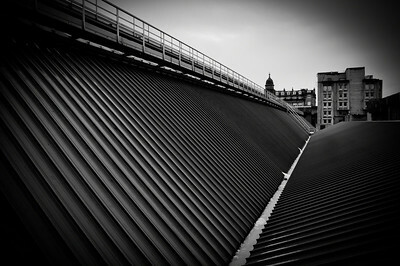 A 2.5 second exposure (f/10) of the 'Squinty Bridge' in Glasgow. I just loved the way the pinks on the lit up arch worked against the pastel blues of the sky (just after sunset). 2017. 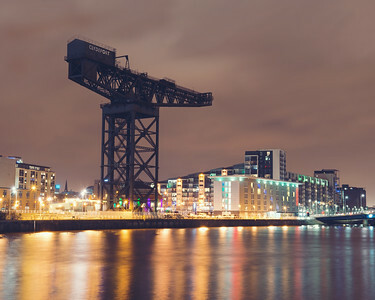 Taken just after sunset, this image shows the BBC and STV television studios nicely lit up on the River Clyde. This image was actually an afterthought, taken as i was walking back to my car. Glad I turned around to take a look! Scotland, 2017. One of my favourites from my hour and half long stint on a very cold River Clyde in December 2017. 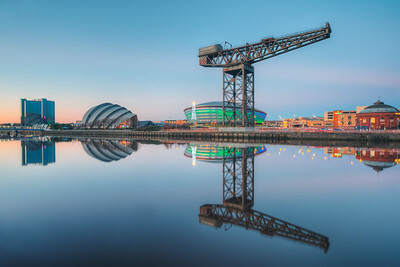 The wind was so calm that it enabled these nice reflections of the Armadillo, Hydro, and the Clydeport Crane. Scotland, 2017. This is an HDR image, using a 1 second exposure as the base image. 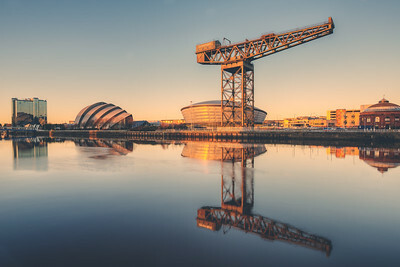 I wanted to catch a sunset shot with the Hydro and Armadillo lit up, but prior to that happening, the setting sun lit up the banks of the River Clyde quite magnificently. 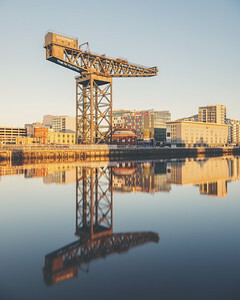 Glasgow, Scotland. 2017.